Through an initial complimentary consultation, we work together to determine if we might be a good fit for a financial planning relationship. We give you an overview of our process and capabilities, answering any questions you may have. We spend most of our time seeking to understand your general financial goals, needs and questions. In a nutshell, we want to know where you’re at, how you got there, and where you’d like to go. The scope of our collaborative work may be a holistic or focused financial plan; or we may work specifically in the area of investment or risk management strategies; and/or it may involve individual, a couple, family, multi-generational or business planning. If we mutually agree on the scope of a financial planning relationship, we move to the next step in the process. At this point, we’ll seek to obtain as much quantitative and qualitative information as necessary. We’ll need to gather various statements and documents. More importantly, we’ll specifically identify your financial goals in the areas of education planning, retirement planning, estate planning or other requested areas. Understanding your time frame for various goals and your attitudes toward risk are crucial to developing strategies tailored to your needs, priorities and preferences. We use state-of-the-art technology and a variety of analytical tools to evaluate your financial picture. We perform an asset allocation analysis of your investment portfolios with a review of the various holdings and full review of your various policies. We identify the strengths and weaknesses of your financial situation, and where you stand with respect to your financial goals given your current course of action. Based on our analysis, we develop recommendations in the context of selected alternative scenarios and propose strategies and solutions to assist you in reaching your financial goals. We’ll collaborate with you to confirm planning assumptions and get a sense of your thoughts about various strategies along the way. 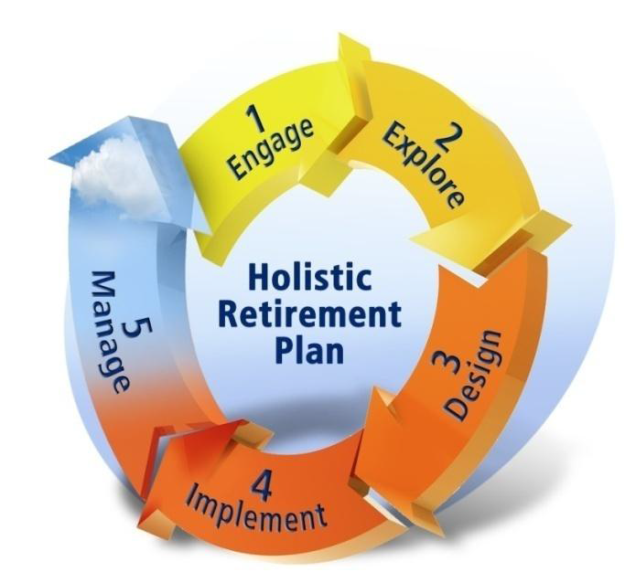 We work with you to determine how to best implement each aspect of your financial plan. This may involve collaboration with other financial professionals you currently engage (i.e. CPA, attorney) or recommending appropriate financial professionals to you if desired. As a holistic financial services firm, we have the ability to use a wide array of providers and solutions to implement your investment, risk management, and estate conservation and business strategies. We’ll continue to monitor the appropriate areas of your financial plan and your progress over time, in accordance with the scope of our relationship. We’ll look to make updates as changes occur in your personal life or in the market overall, taking advantage of new strategies and solutions that may come available over time. As we may change the scope of our relationship or need to make updates over time, we will most certainly revisit the other steps again – as indicated in the circular design at the top of the page.